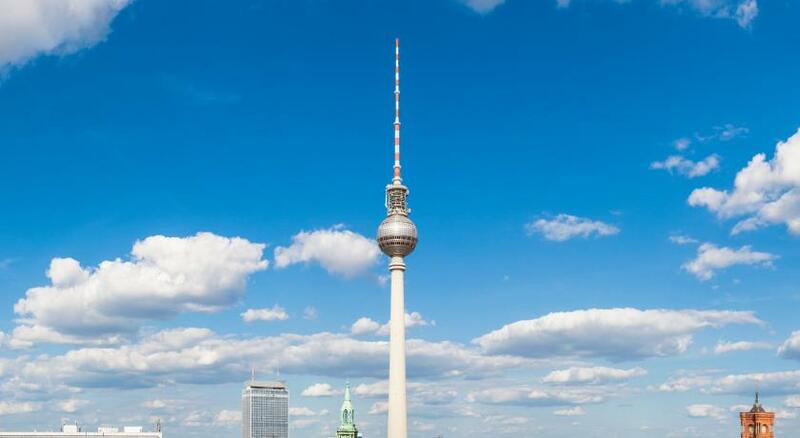 Lock in a great price for Radisson Blu Hotel, Berlin – rated 8.5 by recent guests! The hotel is in prime location. 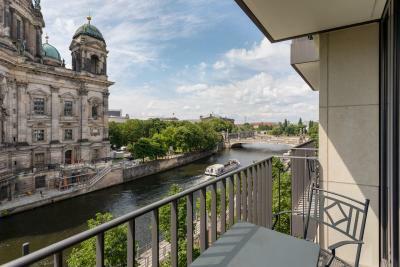 Very close to most attractions and monuments in Berlin and also close to a lot of restaurants. Staff is polite and courteous. Overall had a wonderful stay. There is a parking garage right next to the hotel. The location was great. The concierge really helped us understand the public transport and made our trip so much easier. My room had a view of beautiful cathedral, very close, nice balcony. Lots of simple dining options downstairs. Huge aquarium in the lobby. Awesome and comfortable hotel. 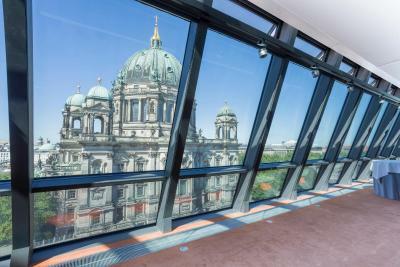 LOVED the view of the Berliner Dom from our balcony. The location of the hotel simply could NOT be beat! Very comfortable and clean room. We had a room with Aquarium view, so nice to watch, expecially for our little son. Great area, staff was friendly and eager to help. There was a problem with the room that was reserved for me and they easily took care of it free of charge! Can’t beat the location. The huge fish tank was wonderful. Our son thought it was the best thing since sliced bread. 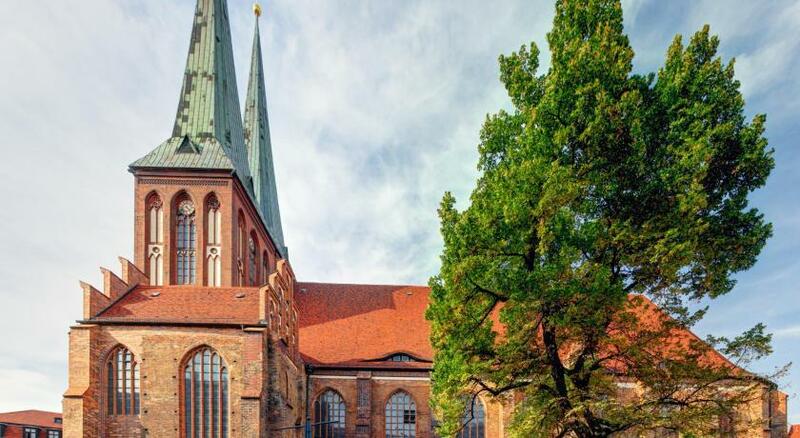 It’s right next door to the Berlin Chapel and all the highlights of the old town. Located beside lots of diners and coffee shops. 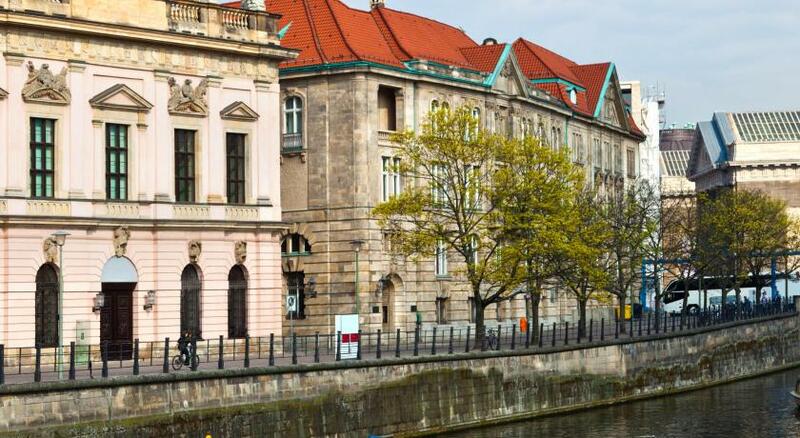 The location is amazing, all museums are very near, also Berlin tower, the shopping areas. 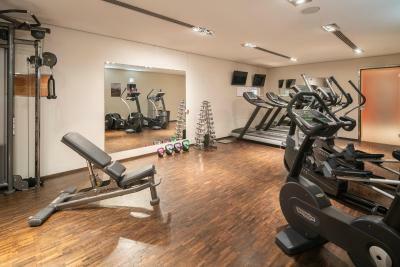 Radisson Blu Hotel, Berlin This rating is a reflection of how the property compares to the industry standard when it comes to price, facilities and services available. It's based on a self-evaluation by the property. Use this rating to help choose your stay! 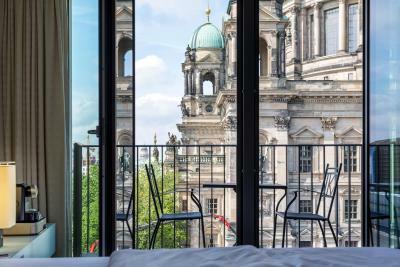 One of our top picks in Berlin.This unique hotel features a 75 feet high aquarium, a spa area with pool and free WiFi. 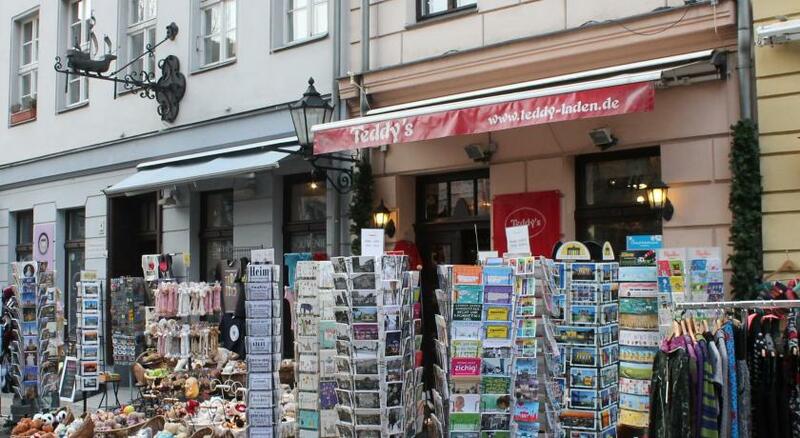 It is centrally located opposite Berlin Cathedral, 2,300 feet from Alexanderplatz Square. 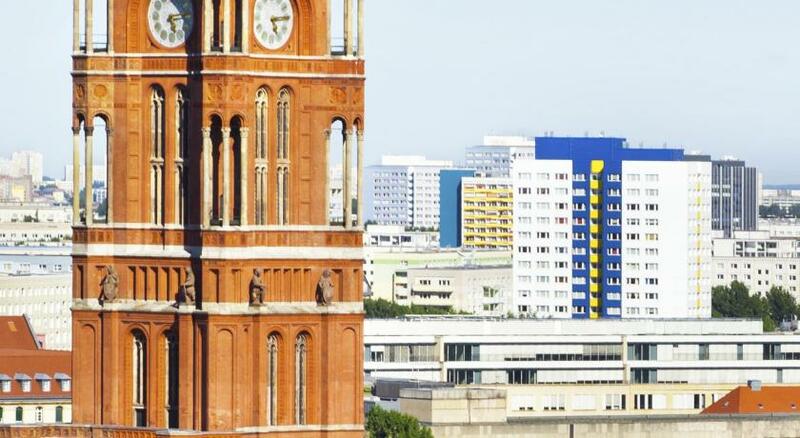 The Radisson Blu Hotel, Berlin offers stylish, air-conditioned rooms with flat-screen TVs and laptop safes. High-quality toiletries and a hairdryer are provided in the modern bathrooms. All rooms are nonsmoking and many have a balcony. Guests can enjoy drinks at the Atrium Bar, featuring an impressive aquarium. 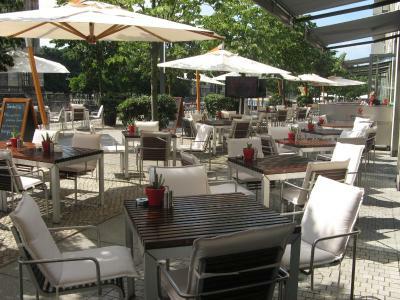 The elegant HEat restaurant serves international dishes and a daily breakfast buffet, and also has a terrace. A take-away breakfast is available. Guests can also download free e-magazines via the hotel app. 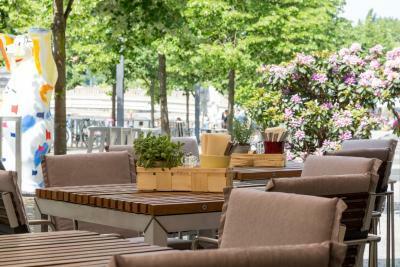 When would you like to stay at Radisson Blu Hotel, Berlin? Contemporary-style room featuring a flat-screen TV and a minibar. Some rooms have a French balcony. Public parking is available on site (reservation is not possible) and costs EUR 22 per day. Contemporary-style room featuring a flat-screen TV and a mini-bar. 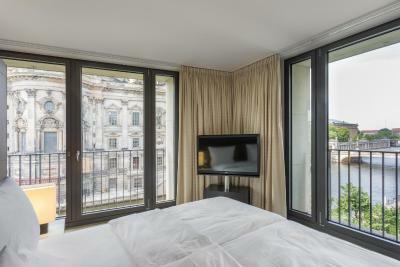 Overlooking the River Spree, this room offers a Nespresso machine, free newspapers, 1 bottle of mineral water, bathrobes and slippers. This large modern-style corner suite offers a seating area, 2 flat-screen TVs, complimentary mineral water and a Nespresso machine. Featuring a large bathroom including bathrobes and slippers. This family room has a soundproofing, bathrobe and seating area. This double room features air conditioning, seating area and electric kettle. This double room has a flat-screen TV, bathrobe and soundproofing. This double room features a balcony, view and soundproofing. This family room has a mini-bar, air conditioning and soundproofing. This family room features air conditioning, flat-screen TV and soundproofing. This suite has a stovetop, satellite TV and dining area. 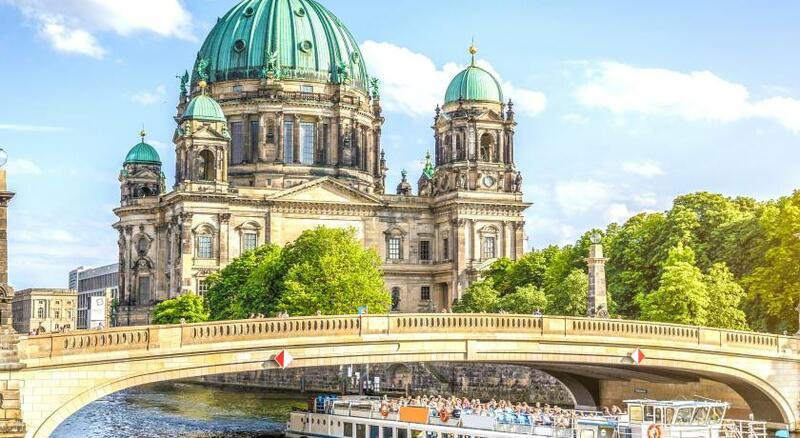 The Radisson Blu Hotel, Berlin impresses with its prime location right next to the Spree River and the Berlin Cathedral. Besides the cylindrical aquarium in the hotel lobby, the hotel provides a very advanced guest service system: "One Touch" - besides the advantage for our guest, to get everything done with the push of just one button on the room telephone, our guests also have the opportunity to use the Radisson Blu One Touch App for room service orders, to download free e-magazines and newspapers, book their activities through the concierge and many more things. 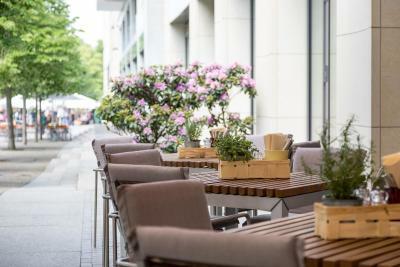 House Rules Radisson Blu Hotel, Berlin takes special requests – add in the next step! Radisson Blu Hotel, Berlin accepts these cards and reserves the right to temporarily hold an amount prior to arrival. Please note that the surcharge of an extra bed (EUR 30) is excluding city tax and excluding breakfast. 30 minutes waiting time at the check in! Paid 208 euros for a double room and our son had to share a bed with us. Extra beds costs another 30 euro and those weren't even available. According to their T&C children up to 12 (!!!) can be expected to share a bed with their parents. Amazing hotel, staff really friendly and great with my 7 year old. Surprise little Birthday cake was left in our room for my daughters birthday! Room was perfect and had a lovely view of the aquarium. Concierge was amazing and a wealth of knowledge, couldn’t do enough for us. Great location for families with lots of things near by and restaurants! We didn't get new clean coffee cups and on one of our days the cups were taken and we were left with one dirty cup. Our 10 year old daughter was looking forward to a swim after a long day walking and when we went up to the pool at 9pm we were told that no children were allowed.. pretty annoying as no on was even in the pool while we were there. The aquarium was stunning.. lovely to see this every time we used the elevator. We had a cathedral view and were overwhelmed with the view.. I have traveled a lot and stayed in many good hotels but for the first time for a prepayed room, i was asked during check in to pay insurance 100 euro that would be refunded after checkout(it took almost 10 days for refund),i didn't book the royal suite just a simple room.Never read it in the terms while booking the room.Housekeeping came to clean the room at 16:00 when we returned to rest, so basically the room was never cleaned since we wanted to sleep.No slippers and mini fridge in room was empty,for a bottle of water i should call room service or buy one on my own down the bar or outside the hotel. 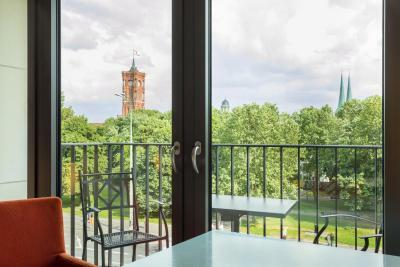 Location is perfect near most Berlin's sightseeing and city center,aquarium in lobby is impressive,room was spacious and comfortable,bed and pillows were nice.Clean room and bathroom.Free wifi in room. We had to pay 50 euros per night in deposit to cover our use of the minibar in the room. But the minibar was empty - why the deposit? Waiting time to check in and stille desks not in use. Staff didn’t know time to travel to airport, near missed flight or cost; unexpected surcharge for child bed. The rooms are very standard and not particularly comfortable. The bathroom is outdated. The SPA facilities are OK, but constantly occupied by children. It would be recommended to introduce children-free hours starting from 17:00. The price paid is high for the value received. 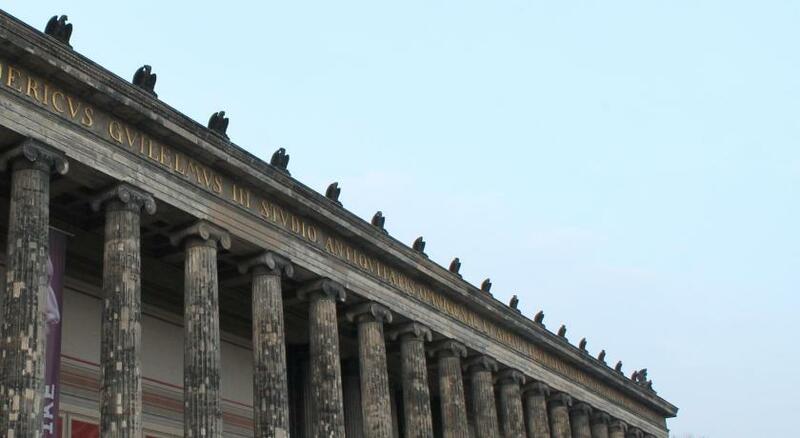 The hotel is very centrally located and within walking distance to the main museums and sights. 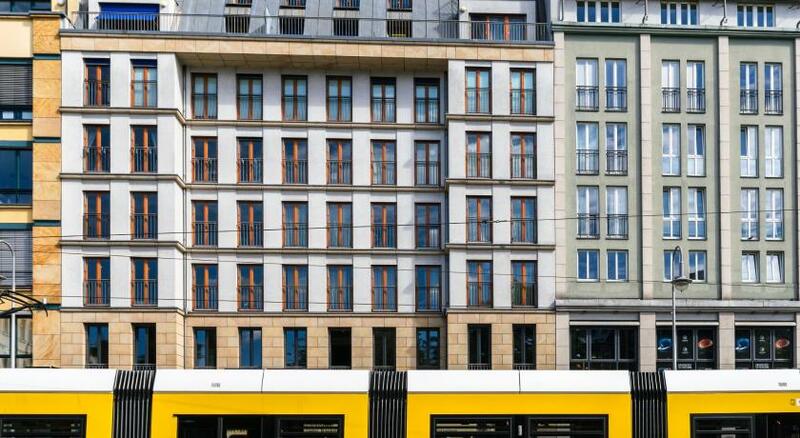 U-Bahn and S-Bahn stations are 5 minutes away.